Recorded at Smecky Studio, Prague, 12th-13th May 2002. This is a lovely Christmas collection of lighter orchestral music, overseen by Gavin Sutherland who can do little wrong in this sort of repertoire. Sutherland�s discs for ASV White Line have been particularly impressive. Here the music is played by an orchestra renowned for its versatility. 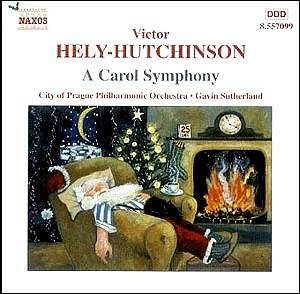 The longest work on the disc is the South African born Hely-Hutchinson's Carol Symphony, made famous by Barry Rose's now 35 years old Guildford EMI recording. This new one stands up very well against that classic performance and is, unsurprisingly, better recorded. The third movement, marked Andante, remains the most impressive, bringing together The Coventry Carol and The First Nowell in a sequence distinguished by some imaginative use of harp, but the "energico" finale is also impressive, first with its orchestral wassailing (more of which below) then its revisitation of the music (Adeste fideles) which started the whole piece. This is a fine interpretation but I still hold several candles for the aforementioned vintage (EMI) recording which is still available in two different couplings: on EMI with VW Fantasia plus Roger Quilter's delightful Children's Overture and Ernest Tomlinson's unmissable first Suite of English Dances; also on HMV Classics, again with VW but with Britten's A Ceremony of Carols. This CD starts with Bryan Kelly's rumbustious Improvisations although, again, here it is the slower music that impresses the most; the central rumination on Past Three O'Clock is a gorgeous, sweeping and masterful take on that lovely carol, bringing to mind Malcolm Arnold at his most creatively lyrical (English Dances etc.). The current prime mover of the British "light" classical scene, Philip Lane, contributes two works here. Firstly, he has orchestrated Warlock's poignant Bethlehem Down for strings (ostensibly as a companion to John Ireland's evergreen Holy Boy) and has captured the melancholy but calm spirit of the piece perfectly despite the absence of Bruce Blunt's immortal text. Lane's typically excellent sleeve note also avails us of the story of the original's "pub crawl" genesis, reminding us of Philip Heseltine's dichotomous existence (as well as persona!). This brings us to Lane's own youthful contribution (written at 23), the Wassail Dances. This tradition is well documented and has given rise to many songs and settings by the likes of Vaughan Williams and, more recently, the brilliant Paul Hillier. Lane's composition is an authentic attempt at bringing them to an orchestral fruition. Yet again (a theme for this disc? ), I found myself most moved by the slower music, although in this case nostalgia played some part. The central Andantino is based on a Yorkshire wassail and it brings back many happy memories of Christmases spent in the village of Stannington which straddles the western fringes of Sheffield and the eastern edge of the Peak District. The wassailing tradition there, as in the south-west, is very strong and listening to this music I was readily transported back fifteen, twenty years to my own personal In Terra Pax, I suppose: a hill top inn, inside frivolity and friends of many years, outside a frosty starry night and being able to see for miles and miles (forever?)! The final work is by Patric Standford, also from Yorkshire, and a composer very much under-represented in the CD catalogue. The ballet Celestial Fire appeared fairly recently on ASV and the Christmas Carol Symphony here is equally accessible and tuneful as that piece. Standford is perhaps as well known recently for his controversial views on Elgar as for his music but here is another splendid piece which will go some way to rectifying that. The music was written primarily as an entertainment for the composer's children. It is beautifully put together and has an economy of style and an obvious affinity with a French or American lightness of touch which may explain his antipathy to Elgar. Do not let the latter dissuade you from buying this excellent disc, another Naxos British music coup/triumph, whatever you care to call it! Enjoy!